On Nov. 17, Mayor Rahm Emanuel and the city of Chicago once again refused to guarantee permits for legal, peaceful protests at the overlapping NATO and G8 summits occurring from May 15 to May 22, 2012. Pat Hunt, a central leader of the Coalition Against NATO/G8 War & Poverty Agenda, explained to the media that CANG8 was demanding that the city publicly commit to providing permits that allow demonstrators to assemble within sight and sound of McCormick Place, the location of most of the summit proceedings, and that Chicago Police Superintendent McCarthy refrain from making further threats of mass arrests of protesters. Accompanying Hunt were representatives from the National Lawyers Guild, SEIU Local 73, and the American Friends Service Committee. Despite this show of community support, officials from the permit division of the Transportation Department and the point person in the Police Department for the summits, Commander Debra Kirby, refused to put the city on record in support of the right to protest NATO/G8 policies in May. The Nov. 17 meeting preceded by only days a denial by the Cook County government, and its private partner MB Realty, of CANG8’s appeal for a permit to assemble in Daley Plaza. According to MB, there will be “no permits” granted for Daley Plaza, one of the few adequately sized public spaces downtown, during the NATO/G8 summits. The United National Antiwar Coalition (UNAC), a founding group of CANG8, first applied for a permit for Daley Plaza last June. The permit denials coincided with revelations about the role of the national government and big business in determining the kind of police response that local governments are mounting against the Occupy movement and plan to mount at the NATO/G8 summits. World Business Chicago, the business group assigned to “host” the summits, has been given $1 million in taxpayer funds but meets in secret, a fact that CANG8 activists will be using to challenge the undemocratic moves of the Chicago city administration. Prominent in press coverage in Chicago about policing strategies has been William Bratton, former police chief of New York City and Los Angeles and now with the huge international corporate security firm, Kroll. Recently, Bratton suggested that the $55 million that Homeland Security has already granted to Chicago in advance of the summit might not be enough. The sudden prominence of Bratton’s company, Kroll, coincides with the news that an entity with ties to Homeland Security called the Police Executive Research Forum helped to coordinate by national conference call the late November nationwide assault on Occupy encampments around the country. According to Shawn Gaynor of the San Francisco Bay Guardian, the Police Executive Research Forum is an international non-governmental organization with ties to both law enforcement and the U.S. Department of Homeland Security. Press statements by Bratton, PERF, and Chicago Police Superintendent McCarthy seem to be part of a national campaign to drown any discussion of the right to assemble and protest the wars and austerity drives of the global elite with tales about the violence that protestors plan to wreak upon the city of Chicago. Chicago TV news of the summits are already featuring images purportedly found on anarchist websites that call for protesters to take to the streets and asserting that they are calling for violence. A host of governmental and private forces dedicated to the maintenance of the status quo are lining up to use the NATO/G8 summits to dampen the majority public support for the right to assemble to protest economic injustice and war. Ultimately, though, the strings for the NATO/G8 summits are being pulled from Washington, D.C. The White House and the State Department have already declared the Chicago summits a “National Special Security Event” and a joint committee headed by the Chicago Police Department and the Secret Service has been established. Obama, who has declared that he supports the right of political assembly and wants to leave the policing of the Occupy movement to local governments, is, of course, lying. The fight to reclaim public space for protest of the crimes of the 1% against the 99% has been catapulted to the center of politics in the United States and elsewhere in the world. The antiwar and economic justice movement now has six months to mount the kind of nationally coordinated civil liberties campaign around the NATO/G8 protests that can deal a decisive blow to government efforts to permanently roll back our hard-won rights. To get involved in this important fight, visit http://www.CANG8.org or e-mail cangate2012@gmail.com. 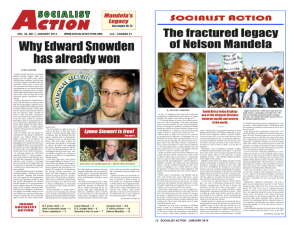 > The article above was written by Christine Marie, and first appeared in the December 2011 print edition of Socialist Action newspaper.